Discover How You - Or Anyone - Can Build The BEST Kind Of Gold Mine Online From Scratch And Reach Out To Your Money ONE Email Away! If You Havent Been Turning Any Of The Resell Rights Products In Your Hard Drive Into Cash, Heres How You Can Exercise Creative Use In Building Your Very Own Paid Customers List - Even If You Dont Have A List To Begin With! Youve definitely heard that the money is in the list. But what is the best kind of list you can build? Answer: A paid customers list. Which also means, the best money money is found in your customers list! Today, its more than possible to actually build your own virtual gold mine from scratch without having to join the early days of the Gold Rush. Just to offer you some ideas to start with, your neighbors or anyone with computer and Internet access can form your gold mine so you can rake in cash over and over and over again. Thats right. Todays gold mine is found in customers. And customers are really abundant. Anyone who exchanges money is your potential customer. In the case of marketing online, you could be reaching out to customers beyond your neighborhood, something your average grocery store cant possibly do! If they like your product or service for the first time, theyll likely return! Unlike publishing a regular newsletter, your customer un-subscription rate can be significantly lower! Customer response rate towards your offer can be greatly increased by 15-20%, maybe more! The result: repeat customers = repeat sales! Every time you have a new product to launch and sell, you dont have to really look anywhere further than your own paid customers gold mine. Thats really worth building your business on! You dont know how to build your own list let alone a customers list. You have accumulated a lot of Resell Rights products but arent using them at all. You have created a product but clueless about getting customers from it. 23 Power-Packed Pages, PDF Format, Instant Download! Heres How To Exercise Creative Use Of Putting Your Resell Rights Products Into Use And Build Your Paid Customers List At Warp Speed In A Short Time Span! Two (2) totally different-but-awesome, time-tested strategies you can use to build your paid customers list with creative use of Resell Rights! How to make other peoples customers list YOUR customer list - even if you dont have your own mailing list! How to strategically create your own unique bundled (Master) Resell Rights package and position it to be your customer-sucking vacuum! The 3 winning advantages and selling points you can tap onto when it comes to building your paid customers list! How to get paid customers for your own product overnight even if you dont have your own mailing list! How to make the most of your own product by giving your customers FULL Master Resell Rights to it in effort of building your leads like a mad house! Tricks on how to get marketers and membership site owners to say YES to helping you build your paid customers list! The 3 places to go to build your paid customers list online! You dont have to necessarily have your own list to achieve any one or all of the above as long as you follow and apply any one of the two creative (Master) Resell Rights concept as introduced in my manual. The amount of paid customers you can get into your specialized mailing list in the shortest time possible! Personally, I have used one of the two methods and got 113 paid customers over the space of 5 days - and thats just with one product! The amount of money you can make from your paid customers gold mine list. Given the right circumstances and offer, your product sales letter conversion rate can go as high as 15-20% (or more) as your customers are generally warm prospects! Significantly less un-subscription rates, complains and free loader issues as opposed to running a regular newsletter! So, How Much Is This Manual Worth To You? Firstly, I warn you NOT to judge the value of this manual by the number of pages it has. But the information within this manual is going to help you construct your own paid customers gold mine and in a real sense, youre really buying a weapon that allows you to make money at will. If you can build your own list of hundreds of paid customers list in just a few days and sell a product at $20.00 per pop to them - your sales letter producing a 15-20% conversion rate - how much would you be earning? Hundreds. Potentially thousands of dollars. All at the luxury of sending one email away. My manual can get you just that once you purchase a copy of Paid Customers Gold Mine and apply the information within. It doesnt matter if you have a barrage of unused Resell Rights products or you prefer to create your own digital products. It doesnt matter either if you dont have a substantial list right now. 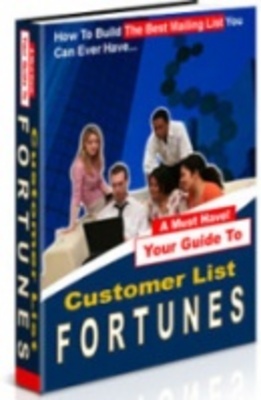 Customer List Fortunes - Build the best mailing list bulding custome list;customer list fortunes 159539838 41.97 fibo0002 Fresh Download Available!